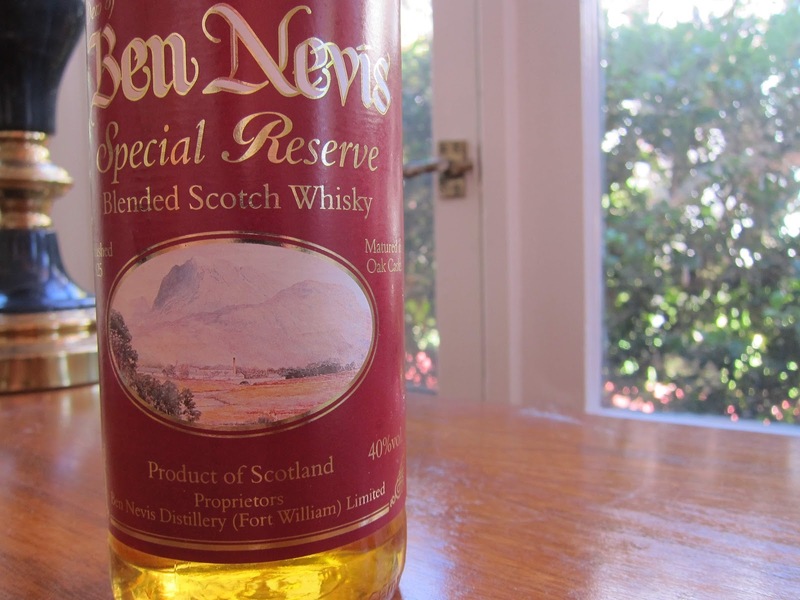 Dew of Ben Nevis Special Reserve (40.0%): Here is a brief history lesson before we start with the tasting: Ben Nevis Distillery was built on the outskirts of Fort William right next to the tallest mountain of Britain of the same name in the year of 1825 by "Long John" Macdonald. Long John Macdonald was a six foot four inches tall lad and he marketed his whisky as "Long John's Dew of Ben Nevis" back then. Later in 20th century Macdonald family lost the ownership of the distillery as well as the rights of the "Long John" brand. The distillery got mothballed twice after and finally Nikka Distilling purchased the distillery starting the production right away the following year. Although Ben Nevis has only a 10yo single malt expression as a regular distillery release nowadays, actually it is quite possible to find several independent bottlings around. 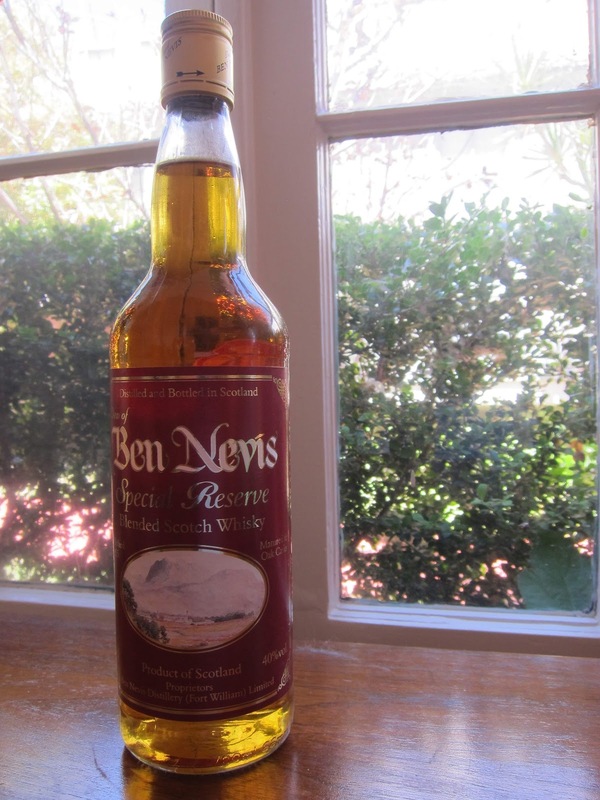 But they do have a solid blended whisky line-up under the "Dew of Ben Nevis" brand which is pretty popular in Japan and the entry level expression of this range is called "Dew of Ben Nevis Special Reserve". According to the distillery's website this blend is added to their range after some of the fans felt that "Supreme Selection" was too smooth... So, let's crack open the 20th candidate in the blend project and taste. The bottle is a house warming gift from a dear friend and carries an UK tax stamp. Color: Medium amber. Looks like a pretty healthy dose of caramel coloring to me. Nose: Noses like 70's Scotch blends. My father's liquor cabinet used to smell like this. Furniture polish, malt and orange blossom honey. Hardwood table top, vintage clothing store filled with leather jackets and golden raisins. After allowing it air a few minutes some smoke and peat evolves. Quite nice... Palate: Toffifee caramel candies, roasted hazelnuts and malt. Rich and oily. Caramel fudge, whole cloves and toasted oak. Cinnamon and young malt whisky. There is an artificial sweetener taste though lingering in my mouth as an aftertaste which bothered me a lot. Finish: Alcohol burn and black pepper. Actually longer than expected with burnt sugar on top of the burn. Overall: Quite ok... I say it is in the same league with Scottish Leader and Bell's but a little less balanced. Good price/value ratio, handles ice well (actually very well) and would pair great with your favorite ale. Gosh, I have such a soft spot for these drinkable lower shelf blends... Give it a try if you see it somewhere.